Her unhappy marriage was filled with extreme financial difficulties, to the point where she was forced by her husband to sell her blood. When she finally tracked down the hospital where her son was taken ― which was affiliated with adoption agents ― it had been abruptly closed. After crying for days, she descended into depression with frequent suicidal thoughts. “I didn’t know who I was anymore. I wanted to kill everyone, including myself,” she said. Noh, who currently heads Dandelions ― a group of Korean birth mothers ― still suffers from the trauma. She reunited with her son, who had been adopted to the U.S., in 2005, but the reunion did not make up for her 29 years of loss. Every March, her son’s birth month, Noh falls physically ill.
On top of the language barrier and shock ― Noh had been thinking her son was adopted to a Korean family ― it was especially heartbreaking to learn that her son was struggling financially, she said. South Korea remains one of the largest exporters of overseas adoptees in the world, having sent about 200,000 children abroad over the past six decades. This means there are also about 200,000 Korean birth mothers -- and some 200,000 birth fathers -- who were separated from their children by international adoption, which brought millions of dollars to local adoption agencies here in the 1980s. About 90 percent of Korean adoptees are born to unwed mothers who have few resources to raise their children alone and are vulnerable to social stigmatization. There have never been government support programs for birth mothers who put their children up for adoption. There is also little research by local scholars on the impact of overseas adoption on Korean birth parents. “Our support programs are focused on mothers who choose to raise their children on their own,” said Lee Hyun-ju, head of adoption measures at the Welfare Ministry. Yet overseas studies have shown that many birth parents, like Noh, continue to mourn the loss of their children throughout their lifetime. This is an ongoing issue. 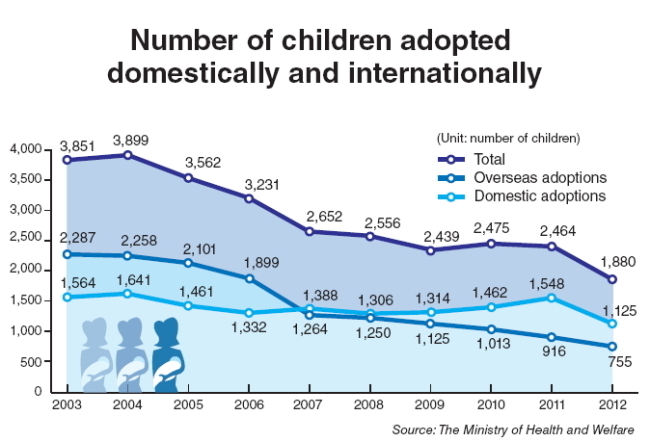 Nearly 3,000 Korean babies were sent for overseas adoption from 2010 to 2013. Even 12-20 years after adoption placement, about three-quarters of birth mothers continued to experience some feelings of loss and grief, a U.S. study found. The study also found that the mothers who tended to experience more longstanding grief were those who felt pressured into placing their children for adoption against their will or lacked opportunities to express their feelings about surrendering the baby. Kim Eui-jung, a psychiatrist at Ewha Womans University Mokdong Hospital, said sorrow and depression, anger, guilt and denial are common among birth parents as they mourn their loss, and even after reuniting with their children. “Korean culture places a lot of emphasis on maternal instinct and mothers’ sacrifice, and as a result, we see many of them being too attached to their children,” Kim said. Secrecy surrounding pregnancy and adoption ― as most Korean birth mothers had been single parents ― can also make it challenging for the mothers to seek support, another reason behind the limited research into their experiences, Kim said. “A key component to anxiety and depression are feelings of powerlessness,” Kim said. Birth mother Noh said she often felt misunderstood throughout her life, as many people, including her close friends, viewed her loss as her choice. “What can you really expect from the government when even your close friend tells you, ‘You know, I had a very difficult life, too ― but at least I didn’t give up my own children like you did’?” she said. On Aug. 12, 2005, the day of her labor, Choi Hyeong-suk stayed in her room as long as she could, enduring contractions ― she was somehow trying to delay her delivery by not going to the hospital until it was absolutely necessary. “I was terrified of going to the hospital,” Choi, who now heads an organization for unwed single mothers, said. Choi, an accomplished hairdresser at the time, had broken up with the father of her son, whom she now raises by herself. Her family did not want her to face hardships as single mother, and told her to place the baby for adoption ― for the sake of both the child and herself. While pregnant, she stayed at Ae Ran Won, a shelter for unmarried and pregnant women, until she gave birth. Just about eight hours after her delivery, she signed the final adoption papers and her son was taken away from her. “I was told to say the last words to my newborn,” Choi said. After placing the baby for an adoption, Choi left the hospital immediately, feeling as if she did not deserve any medical care after relinquishing her own child. “At the shelter, there were mothers staying with their babies ― and all I could hear was their noises,” she said. After two weeks of waiting, Choi had her son back. Almost a decade has passed since then, but the two weeks of separation still affects Choi. Like Noh, Choi also gets sick every August ― her son’s birth month. “I get so ill I can’t even get up,” she said. Choi still keeps in touch with a number of women she met at the shelter, one of whom sent her son for adoption to Australia. The woman gave birth to her child about a month before Choi did. One time, the friend ― who believes her son will visit her one day ― asked Choi to ask overseas Korean adoptees a question on her behalf. “She told me to ask them, ‘would you be happy to learn that your birth mother is living a happy life when you reunite with her?’” Choi said. While Choi thinks keeping her child was the best decision she’s ever made, living as a single mother in Korea hasn’t been easy. Her hair salon went out of business after it became known in her neighborhood that she was an unwed mother. Her son has been bullied at school for having a single parent. Still, Choi thinks overseas adoption should be the last resort. “It is a temporary solution to a permanent problem for both adoptees and birth parents,” she said. When Choi was pregnant, American adoptive parents visited the shelter to meet with pregnant women who were considering placing their children for adoption. The couple shared their family photo album with the soon-to-be mothers, which included many photos of their daughter ― whom they adopted from Korea. In the photos, their daughter was taking swimming lessons and playing the violin in a pretty dress. “After looking at the album, I thought it would indeed be better for my son to be adopted,” said Choi, who also interacts with adoptee activists. “I was also told by many that it was the best to send my son to the U.S., because there are a lot of Korean adoptees there, and there is no racism in America. Most of us at the shelter thought what we were told were true. Many didn’t really know what racism even meant. The Korean government currently offers a number of support programs for Korean overseas adoptees, including Korean language programs and support for birth family searches. The number of overseas adoptees who return and live in Korea is also increasing, according to the state-run Korea Institute for Health and Social Affairs. Kim Mee-sook, a researcher at the think tank, said there should be support programs for birth mothers as well, especially foreign language courses and counseling sessions. This would eventually improve their relationship with their separated children, she said. “It’s normal for birth mothers to feel angry and guilty, and they should have an outlet to let it all out,” she said. Meanwhile, Dandelions, the group of birth mothers headed by Noh, has only about 40 members. Among them, about five show up at their gatherings regularly. “It’s hard for birth mothers to unite because many keep their stories a secret, while suffering from feelings of guilt,” said Noh, who opposes transnational adoption.